With the participation of 26 Grandmasters, 20 International Masters, 10 FIDE Masters, 12 Women Grandmasters, 8 Women International Masters, 2 Women FIDE Masters and many other strong chess-players from 26 countries (Armenia, Azerbaijan, Bosnia and Herzegovina, Belrussia, Bulgaria, Ecuador, England, Georgia, Greece, India, Israel, Italy, Lithuania, Luxembourg, Moldava, FYROM, Netherlands, Poland, Romania, Russia, South Africa, Slovenia, Serbia, Turkey, Ukraine, Venezuela) the 24th ICT Acropolis 2009 is ready to begin. On Monday, August 10th, 104 chess-players will begin their games in the beautiful town of Chalkida (around 70 km north of Athens) that will last for nine days, until August 18th. 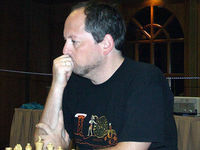 Top seeded is the winner of Acropolis 2007 and Acropolis 2008, GM Ilia Smirin. This year’s Acropolis ICT is a co-organisation of the Greek Chess Federation and the Chalkida Chess Academy ‘Palamedes of Evia’, sponsored by the Greek Ministry of Tourism and the Greek National Tourism Organisation (EOT), the Greek Ministry of Culture, the Greek General Secretariat of Sports, the Region of Attica, the Region of Sterea Ellada, the Prefecture of Evia, the Chalkida Municipality, the TEDK N. Evias, the Football Games Prognosis Organisation (OPAP), the Chalkida Sports Organisation and the ‘Chalkis’ AVEE. Parallel with the Acropolis ICT, one more open tournament for players under 2200 FIDE rating will take place, on the same dates and on the same time-schedule. 68 participants have already been registered. More information about Acropolis 2009 at the official site.